Because critical decisions often directly affect the value generated or lost by an organization, it is helpful to organize the necessary information in the form of a value model; this model can be created in a collaborative manner and revisited when the team gets new information. The graphic below shows the value model, including how it organizes the key information needed for decision making. The Chief Technology Officer (CTO) of an organization found a need to manage his portfolio of infrastructure projects. All previous attempts to organize and prioritize the portfolio for the steering committee failed. He worked with the decision model and assessed his list of projects based on purpose, uncertainty, and complexity. First the steering committee used purpose to define the IT strategic plan; then they used complexity and uncertainty to assess capability to complete. Along the way, they found ways to reduce uncertainty and complexity and identified capability gaps that needed to be filled before any new projects would be undertaken. Using these dimensions, the portfolio fell into place in a few hours. The steering committee then prioritized and balanced the list. There were two differentiating projects, but one of the parity projects was an enabler to both. Therefore, the priority was to fill the capability gaps and do the parity project. Only then would the organization take on the differentiating projects. Purpose is not priority: The company and CTO’s team now knew what to do. Uncertainty, complexity, and purpose broke the logjam. Without value models, you risk deciding in favor of something that does not generate business value or deciding against something that does. 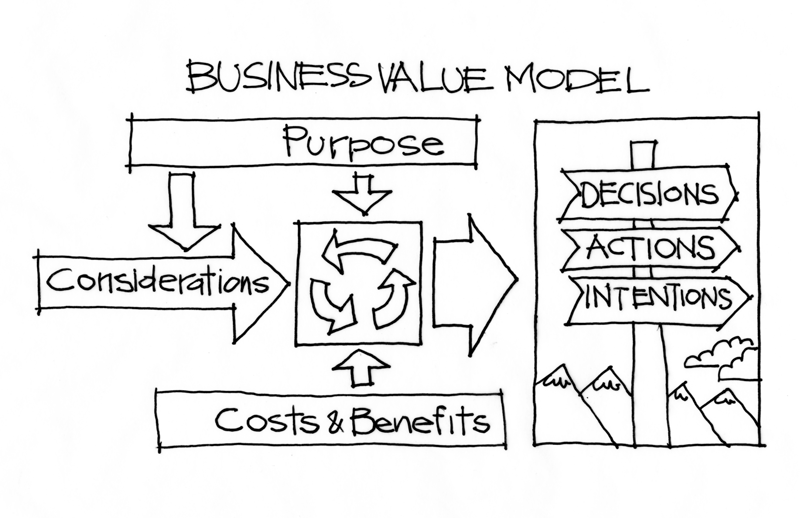 Value models provide a clear advantage over the traditional decision making models. Value models include a number of factors beyond just cost and benefit and are based on delivering value to the marketplace, thereby making the organization better in a meaningful way. Identify the critical decisions facing your organization that warrant an extra bit of scrutiny and analysis. Select decisions where the effects of a decision outweigh the costs incurred to reach it using this approach. Determine when these decisions need to be made. This time frame is usually based on when options become no longer available, or when the cost of a delayed decision outweighs the value derived from making the decision. Determine the information required to make an informed decision. Deﬁne the purpose, considerations, costs and beneﬁts. Use the time until the decision needs to be made to gather the information identiﬁed in step 3. Organize this information in the form of a value model so that you are able to revisit your decision when the inputs change. When you have gathered all of the necessary information, or when the time to decide arrives, make the decision based on optimal value delivery to the marketplace. Implement the decision as effectively and efﬁciently as possible. Repeat the decision-making process regularly, especially when conditions change. Better decisions are a conversation, not a number. 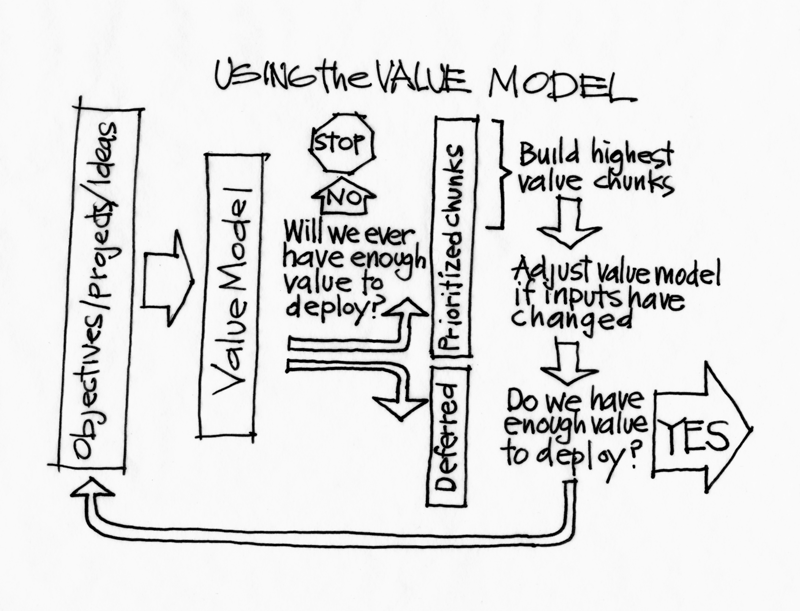 The output of a value model will likely not be a number or a calculation. Instead, the model results are a conversation about the various factors that go into making a better decision. The value that your decision generates is based partially on how well you align your decision with the purpose. If you need to close a gap in one of your mission-critical activities, your decision should not attempt to create differentiation. If you need to use an activity to grow market share and gain new customers, your decision should not be satisfied with reaching parity. This comes from the Purpose Alignment Model. The result of the cost–benefit analysis remains an important input to your value model—but it is not the sole input to your decision-making process. In some cases, costs and benefits will inform your decision. In other cases, they will not. As long as you estimate the cost-benefit of two initiatives with the same level of precision, you can make better decisions. Thus, instead of spending a great deal of time trying to establish estimates at a precision level that may not be attainable, establish relative measures of cost, benefit, and value and then converge on more precise, financially based measures as you gather more information throughout the course of project implementation.